Ever since I was a little girl Grease has been one of my all time favorite movies! I love the characters, songs, clothes, and everything else! 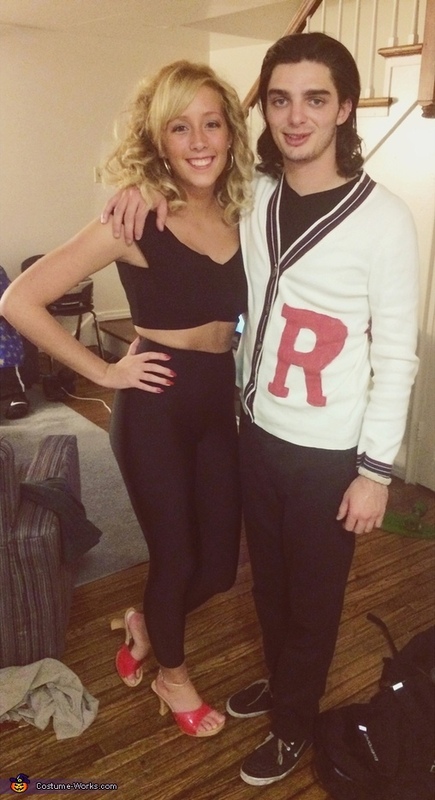 This year for halloween my boyfriend, Chris, and I decided to be Danny and Sandy! I looked everywhere online for costumes but everything looked super expensive! So, I decided to go to one of my favorite places, the thrift store! I went into trying to find an outfit thinking I would never find the exact type of shoe Sandy wore (wooden open toed red high heel) but to my surprise the thrift store had the exact shoe! The only problem was that they were red. I went to michales and bought red paint, painted them and sprayed them with an acrylic spray to finish them off, they came out perfect! I always was able to find high waisted black leggings and an off the shoulder black shirt. For Danny's outfit I was able to find a white sweater that slightly resembled the one from the last scene. Again I used the red paint to recreate the jock sweater with the "R" on it. On Halloween night we got lots of complements and everyone loved it!